A marketplace can always be a good setting for an urban adventure, as well as a way of making the necessary gathering of supplies and equipment a bit more interesting. 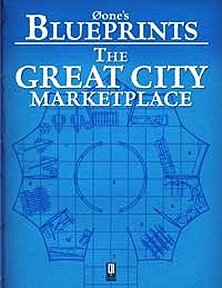 Publisher's blurb: "Enter the bustling hearth of the Great City business, enter the ever-crowded bazaar the Great City is renowned for, enter the Marketplace! "This great business area is situated in the very center of the Great City and, day by day, hundreds of street vendors, peddlers, foreign merchants, barters and food vendors gather in this place to make business. "A small fence surrounds the marketplace for the sole purpose of delimiting the area; often, in fact, many vendors set their booths outside the fence due to the lack of space. During the night the city watch patrols the area in order to prevent theft and robbery. Merchants of the Great City also have representative booths in the Marketplace and they think having a shop facing the marketplace is a great deal; for this reason the shops in the square are highly prized."